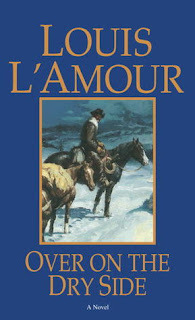 Over on the Dry Side by Louis L'Amour is available at Amazon, Barnes and Noble, and BooksAMillion. The abandoned cabin seemed like a good place to settle down . . . except for the dead man in the front yard. But Doby Kernohan and his father had traveled a long way seeking a new start, and they were in no position to be choosy. Unfortunately, the mysterious man’s violent end was an omen of darker events to come, for a cycle of violence that had begun long ago was about to reach an explosive conclusion. Caught in a tangle of murder, greed, and blood vengeance, the Kernohans have no choice but to get involved. And when a mysterious beauty from deep in the surrounding hills and a deadly stranger named Owen Chantry arrive, what had at first seemed like good fortune suddenly becomes a terrifying fight for life itself. L'Amour attempted a new narrative style with this book - multiple points of view (POVs) pop up sporadically in his other stories but this book uses multiple POV more consistently than his previous attempts. Doby Kernohan is a sixteen year old boy with some rough po' white boy vernacular. This can be tough for folks who don't appreciate dialects - it's one of my favorite parts of the book. Doby's POV is off-set by educated Owen Chantry, who speaks with (mostly) proper grammar. L'Amour succeeds at keeping the two main characters separated by voice. L'Amour spent a lot of time building tension between his two main characters, only for it to fizzle out at the end. The plot isn't much better - it builds well, but the mystery is one that readers can't solve because we aren't given what we need to solve it so we're dependent on Owen to tell us the answers. It feels like L'Amour just connected the pieces as quickly as he could to reach the ending; I wish he had taken the time to properly finish this tale because I did enjoy reading this book, it just doesn't deliver the ending it deserved.